I'll be watching a video (youtube, for example), and the video will start to lag-think a slowdown to a few frames per second. Oddly, audio is unaffected, and continues to play as normal. Then I'll move the mouse, and it immediately returns to normal. This happens every few minutes. I opened Resource Monitor, and it looks like CPU is clocking up to max frequency until I move the mouse, then it returns to normal. CPU utilization doesn't max out, only the frequency of the chip (I guess?). 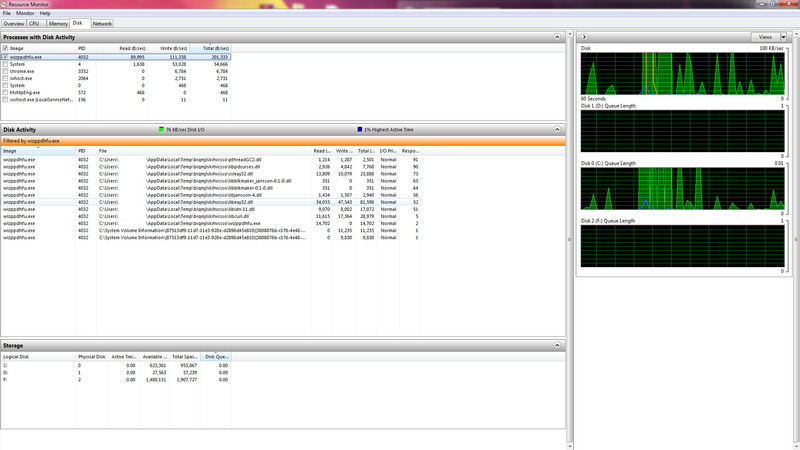 Memory utilization seems to be unaffected. I have a Core i7 2600k. I'll have to test this. However, I looked closely at the memory graph- it looks like the sudden lag also corresponds to a brief uptick in hardfaults/sec (where before there were none). This has to be related somehow. Edit: it doesn't only happen in Youtube. Vimeo displays the same behavior. Sorry for the double post, but I have more data: during these occurences, hard drive activity jumps to 1MB/s until I move the mouse. From a maximum of 100KB/s. How are these things related? EDIT: NOW I'M GETTING SOMEWHERE! I've identified a process that's extremely suspicious. Wizppdhfu.exe is hammering the disk. It seems to be creating a bunch of temporary files, a ton of DLLs. There are some forum posts that indicate that it might be related to some kind of Trojan. I don't know how to remove it though, the exe disappears when I move the mouse. OK, this is definitely a trojan. I kept the temporary directory open, where Resource Monitor was placing the mystery .exe. I opened a video, waited for slowdown. As expected, a directory was detected called "biqmjlskihvcsso" (nonsense of course). Inside were all the DLLs, and the mystery exe, called wizppdhfu.exe. I immediately copied these to a different directory to examine them. I opened it up with Notepad ++. My suspicions were confirmed, this is some kind of Bitcoin miner trojan. I have no idea how to remove this thing, or if it's still active on my machine. Windows Security Essentials did NOT detect it. If it is a trojan, and you cant remove it; Just back up your files and reinstall windows. I have the same problem on win 8.1, with different file names. Is there any solution other than reinstalling windows? It was a while ago, but I think I ran Malwarebytes anti-malware and anti-rootkit, and it seemed to remove the trojan. I'd really really appreciate this as so have this issue. EDIT: I have also found an executable file appearing on Resource Monitor when not using my mouse ("vpecyihvyphx.exe"). How do I use the Monitor to find its folder? EDIT 2: Just ran MalwareBytes Anti-Malware. It seems to have done the job for now, so I recommend it for that. I'll keep you posted in case of any side effects/ reoccurences. Hi, I just wanted to add to here as this same issue has been driving me nuts lately. 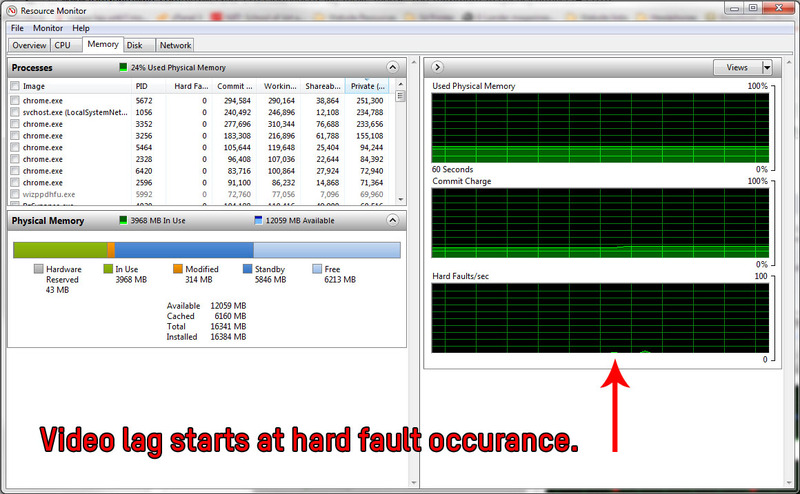 I'd like to add that this problem isn't just happening with Adobe Flash videos. This problem also happens when videos are played in HTML5 video player as well. Also, I am having this problem in all 3 browsers: IE, Firefox, and Chrome. Some of my previous research pointed me to an idea that it is possible that I have a virus on my system. Well, I ran malwarebytes and indeed found some trojan problems that I suspect recently got onto my system (Thank you! Microsoft Security Essentials for providing a superb protection). I removed the problem. However, that didn't change anything. I am still having the lag in HTML5 video player and Flash video player. So, again, to describe the problem, my videos play normally for 2-3 minutes (normal screen or full screen) and then they start to lag, i.e., videos start to show about 2-3 frames per second and skip lots of frames while sound being unaffected. Then, as soon as I move my mouse, the playback goes to normal. WTF??? I tried disabling other unneeded plugings, like VLC, etc, but that didn't do anything. I tried removing the mouse and pluging it back in - nothing. Disabled/Enabled either of the 2 Flash plugins that are in Chrome - nothing. Disable/Enabled hardware acceleration - nothing. I tried adjusting in Firefox the value in about:config of browser.sessionstore.interval to 3600000 - nothing. I am getting sick of this problem. I can't watch anything away from the computer and have to constantly move the stupid mouse to get the playback go back to normal every 2-3 minutes. I have to same problem here few days now. I dont know if you guys have solved it after all this time, but if you've found a permanent solution, i'd love to know it! By disabling Windows Event Log, i have managed to avoid the lag only in VLC player, but the rest of the players and the browsers keep lagging after 2-3 minutes until i move the mouse. I too have this issue with YouTube, VLC, fullscreen games, etc. I've suspected a trojan too but don't see any errant .exes hogging memory or CPU. Long story short I am curious if there's a solution other than reinstalling Windows. Download Malwarebytes. Just make an update/fullscan and it's just a trojan which gets removed. After that i suggest to completely deactivate Windows Defender and keep Malwarebytes going. (If you already have another antivirus than Windows Defender, i'm not sure what else to suggest, these are the steps that I took and my problem is fixed). Ran MWB twice this week and no change to the VLC/youtube stuttering, fyi. I started to get the same problem this week. For the record I had to reinstall Win OS entirely, but that got rid of the trojan and symptoms. I ran a program called RKill which told me to delete three files. the stuttering seem to be gone now. Guessing a bitcoin mining-program that started running when the mouse and/or keyboard wasent active for X amount of minutes. I've got to chime in. Was having the same problems with new Kodi build (17 Krypton), running on Win7- Firefox as browser. No Malware/Trojans found and I was baffled. I was sure it couldn't be the "Use hardware acceleration when available" because it would lag and stutter even with Firefox not running... But, sure enough, that fixed it. Just go into Firefox, then Tools/Advanced/ Uncheck "Use hardware acceleration when available". Not sure how it helped even without Firefox running, but it did. Thanks for all the help, hope this helps out some other folks. Update: After working for about 5 minutes, it's back to lagging. Here's what I've done: CHanged settings in Kodi through "Easy settings" add-on. Put in specific values for my memory buffer size, etc, turned off de-interlace... No good. Used specific values in Kodi settings (via several YouTube reputable users) trying the "accelerated" Firefox setting both on and off...No good. 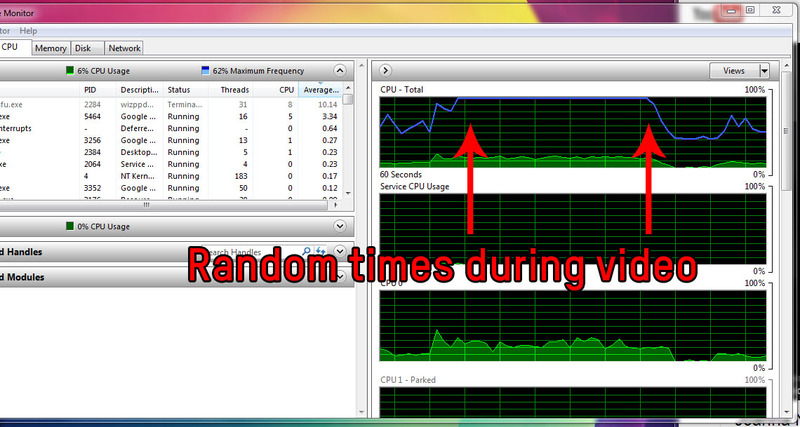 There is nothing popping up in Task Manager other than "System Idle" that uses more than 4-5% of CPU. So, back to square one. I'll update this if a solution pops up. Has my phone been hacked? Could videos downloaded from YouTube videos be infected (by Youtube)? Pressing home button and most of the websites redirect to a donkey video on youtube. Is WinPcap software installed with Freemake Video Downloader ( bundled software) a spyware? Can I run two video cards of the same kind, but differently branded in crossfire? Cursor pausing video and opening tabs in Firefox on two different computers. "No video input to monitor" but cpu is restarting again and again withing 30 sec. Youtube link won't open anything, but my uploaded videos.